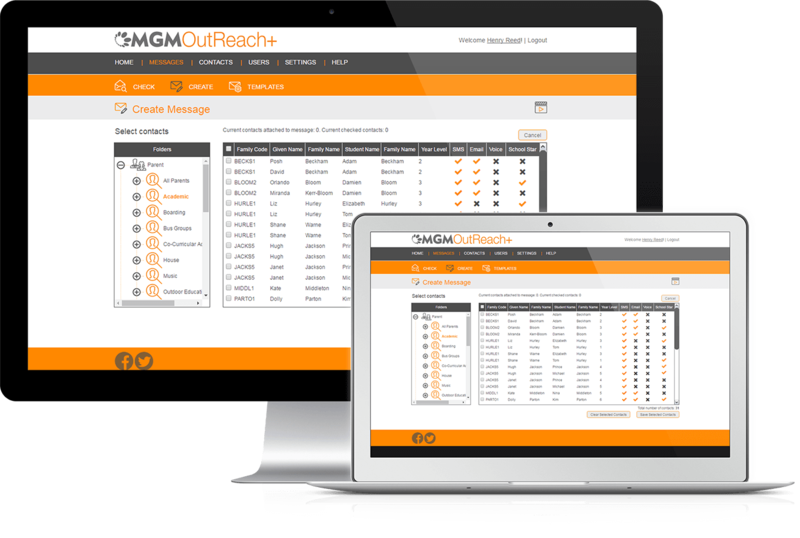 Outreach+ makes it easy to manage all your school communication and engage parents using one simple system. 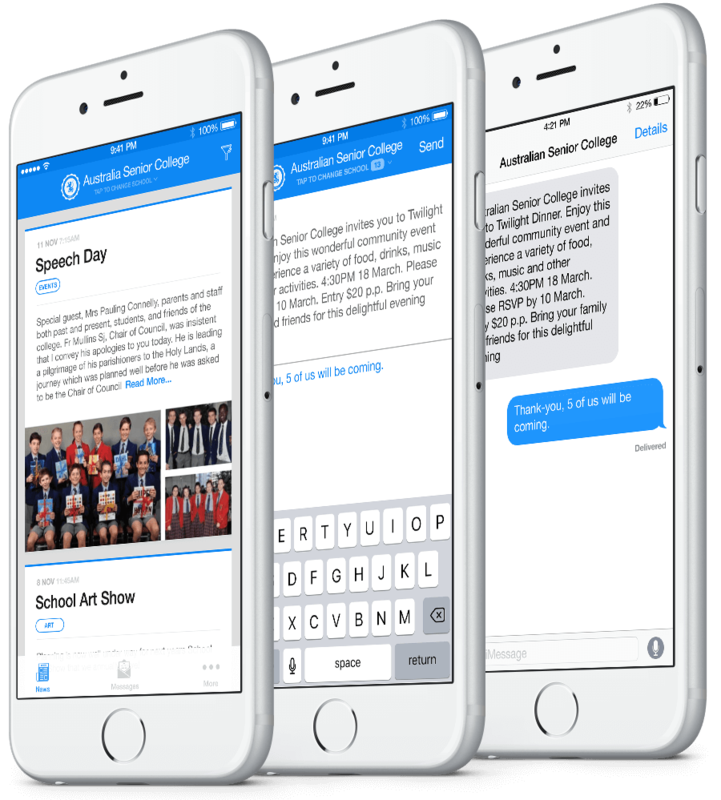 With integrated 2-way School Star in-app messaging, auto failover to 2-way SMS, email, App School News Feeds, all your social media networks and website, Outreach+ gets all your school communication delivered – no matter what your parents’ communication preferences. For personalised communication, Outreach+ seamlessly interfaces to your existing school databases to use your current parent contact details and family groupings. No more manual, error prone uploading of spreadsheets and files. Media analytics and graphs give you an in-depth view of how well your parents are engaging with your communication efforts. See which parents are using the School Star App, which are reading in-App messages, SMS and notices, and which of your school news items they like most. 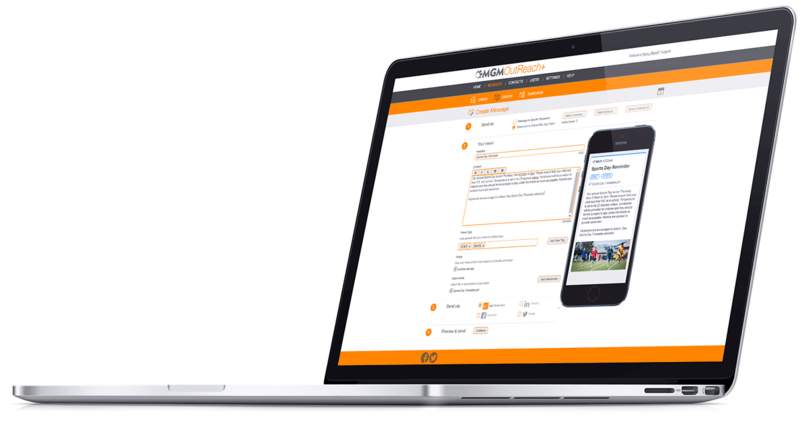 Outreach+ has all the policy controls, audit trails and security functionality to truly support school-wide news and messaging adoption by school staff, leaders, sports administrators and class teachers. It’s your tool for a quality-controlled, secure school-wide parent communication and engagement program. School news, newsletters, personalised messaging, alerts, absence notifications, sport, cancellations, emergencies, notices, information, timetables, parent sick note forms, school documents and much more. When you need to individually contact parents, and personalise your messaging, Outreach+ seamlessly interfaces to your existing database to access your current parent/caregiver names and contact details. Say goodbye to manually uploading files or spreadsheets with parent details. Outreach+ restricts communication and access to your school information to only known parents and school community members who are registered in your existing school databases. The public and everyone else is locked out. Control which parent’s staff can contact according to their management level, class, sports team or other custom group. Control the type of communication staff can send by restricting them to using only pre-approved message templates. Essential for Teacher, external Sport Staff and non-senior school management use. The School Star App (even though it’s one standard app for all schools) looks exactly like a custom branded app for your school. It incorporates your school image, brand and feel. SMS and file attachments are branded with your school logo. Outreach+ is a powerful way to boost your school’s image and profile. To access your school news and messages, parents first need to complete a once-only, 3-step security process. First, their mobile number needs to match with your school’s existing database and records. Second, the personal details they enter also need to match. And finally, they need to enter the Security Pin Outreach+ sends them by SMS before they get access to your school news. Outreach+ keeps full audit trails of all communication between parents and your school, including when and how every user accesses Outreach+. Monitor the communication quality of every school administrator, leader, sports administrator, teacher and every other user. Easily find the causes of any problems if they occur. We keep your Student and Parent data safe and secure, using ASIO standard security throughout our infrastructure. MGM only uses direct SMS routing to Australian Mobile Network Providers. Your student data will never get into the wrong hands, parents will never receive SMS spam advertising and your school data will never be sold to others. continue reading below to find out more…. Instantly see the how well your parents are engaging with your communication efforts. Outreach+ media analytics and graphs give you an in-depth analysis about which parents are using the School Star App, who’s reading in-app messages, SMS and notices and which of your school news items they like most. Control school staff use of Outreach+ according to their role and management level at your school. Each user will only see his or her messages and parent replies, but higher level Users and System Administrators can see all the communication managed by users subordinate to them. Securely send messages (like last minute changes to sport fixtures or school emergencies) or upload School News to the School Star App securely anywhere and anytime with the Outreach+ School Leaders App or through the Outreach+ website. School leaders do not need to be at school to communicate with parents. Do you have a community member whom you need to block? Outreach+ allows you to lock out individuals from access to the School Star app, so that they cannot receive school news or SMS messages. Outreach+ groups all communication by family (and extended family) unit. Instantly see all the messages and news item read activity by both family member and family group. Finding the details of parents you need to contact can be difficult. With amalgamate families and constantly changing family structures, caregiver and student surnames often differ. With Outreach+, you can find the parent you need to contact in many ways, such as Student First Name, Surname, Home Group /Class, Year Level, Sport, Co-curricular activity and more. Get better engagement and response. Boost your image and brand. Add the personal touch by merging any personal details like names, classes, and more (accessed by Outreach+ from your existing School Databases) into your communication. Sports teams, extracurricular activities, school staff, alumni/old scholars and all other student, family and parent groupings are easy to access. Contact groupings are automatically retrieved from your existing student management system, and for custom groups you can create your own. Sometimes it’s too early or too late in the day to send your communication. Or, you may just want to plan ahead. 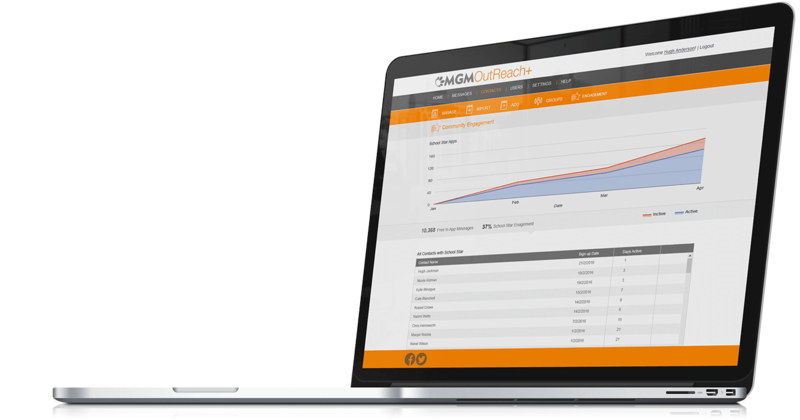 With Outreach+ powerful scheduling, you can prepare any personalised, general and even all your social media network communication at any time for delivery at any future time. Save time. Control your communication. Simply select the most appropriate pre-approved template from the Outreach+ template library, merge your personalised fields and send! School Leaders can create their own custom templates or edit existing ones. Parents usually forget to identify themselves or their child in messages. Outreach+ automatically identifies the parent and matches the incoming SMS or in-app message to student name, class, home group, sports team(s), pastoral carer and more. Instantly see how your School News, messages, pictures, videos, forms, notices and all other attachments will be displayed on your parents’ smartphones. Outreach+ lets you refine your presentation before you send it. Outreach+ and the MGM School Star App have been designed by Australia’s leading graphic and user interface designers. Beautiful, simple, elegant, and easy to use and learn. Outreach+ and the School Star App boost your school’s brand and image. 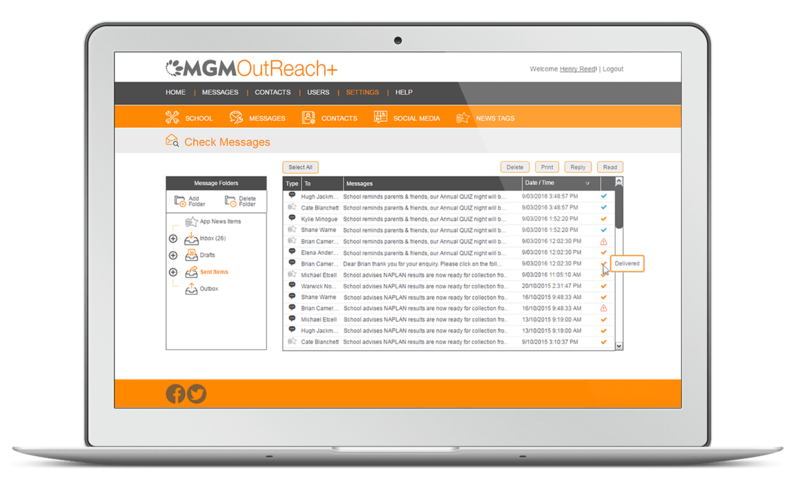 MGM’s powerful school in-app messaging and SMS network will tell you the delivery status of every message sent. See which messages have been sent, delivered and read. When you want to communicate beyond your immediate school community, Outreach+ can post your School News items and other communications directly onto any of your existing Social Media Networks. Outreach+ will keep trying to deliver your communication according to your chosen method. Send in-app or SMS messages first, but if unsuccessful, send by email, then text-to-voice voicemail – or for extreme emergencies, send your message using all methods all at once! When there’s no mobile phone coverage, no mobile internet, no Wi-Fi or parents don’t have a smartphone, Outreach+ has every type of communication method to get your communication through. Whether your parents in-app or SMS your school, their messages will always arrive in one Inbox Folder. 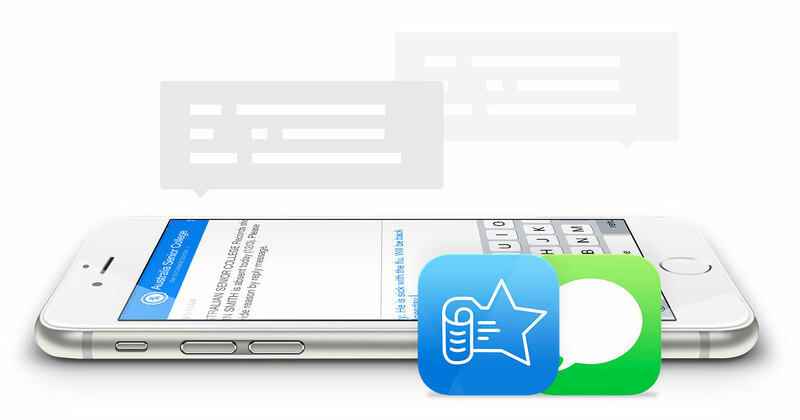 School messaging has never been easier, faster or cheaper! Only school registered parents, caregivers, staff, students and old scholars/alumni can send messages to your school. Unknown senders are automatically blocked. The School Star app is constantly upgraded and fully supported on Apple iOS and Android. Get up and running on your own terms. Throughout the system, there are short training videos and user documentation. But for instant help or if you’d like some communication coaching, just call or email at any time.